The main technique used to control and generate music in the AMPs project is MIDI (Musical Instrument Digital Interface). For this you need something to convert and translate the actions of the human into the electron sounds from an electronic synthesizer. In this case the Arduino's is the MIDI controller and the Music Instrument shield is the synthesizer. Hardware Controller (left). At the heart of the "musical prosthesis" is a small micro controller called an Arduino's. Full details can be found at http://www.arduino.cc/. This has been programmed to act as a MIDI (Musical Instrument Digital Interface) controller. A 5 Pin DIN socket, a 220 ohm resistor and a MIDI cable is all you need to play scales or tunes on a MIDI enabled keyboard. These devices can be bought from any number of online retailers. The Sparkfun Music Instrument Shield, (right) it clips on top of the Arduino's motherboard. Sparkfun make this aimed specifically to use as MIDI controller. Once you have located this device on their web site there is example code that can be tweaked to your own requirements. N.B. Many shields of similar functionality can now be found via UK retailers. There are a range of "cookbooks" (see reference for a selection). Software: Two types of software are needed. The first is the Integrated Development Environment (IDE), available as a free download from http://www.arduino.cc/. It works on PC's and Macs. The second type of software is your programme. 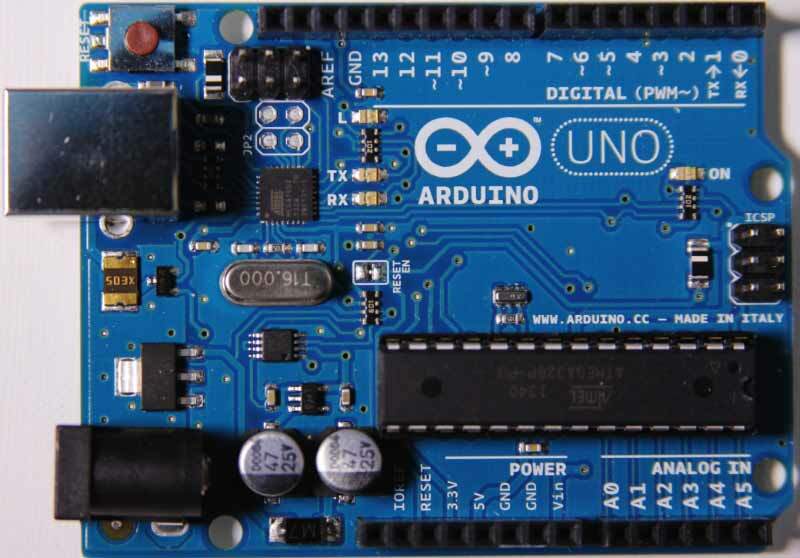 The Arduino's web site provides many workable examples and tutorials, as do a number of the shield manufacturers. Techniques, Topics and Methods used to create devices. Amplifiers I use inexpensive Class D most of the time, though for demo's it is a must to use professional grade amplifiers. Boxes and Cases Usually I make bespoke from plywood or MDF, especially for all in one boxes as the have better acoustic properties. Capacitive sensors Bare Conductive fills the bill for the moment though (Dec 2017) I'm looking at some Adafruit devices since have learnt how to adjust sensitivity. Channel Splitting It's possible to pan hard left and hard right on a MIDI signal. So Channel 1 fires left, channel 2 to the right. This means you can (say) drop a an octave or so on one channel to activate a surface transducer to support haptic applications whilst the other channel energise a speaker working in nth audio range. Connecting Up (internally and Externally A constant preoccupation to make reliable connections. With either, 3.5mm, 1/4in, XLR or phono. Construction Materials and Techniques. I largely make my own boxes as that makes them work better with an individual user. MP3 Players (bespoke). 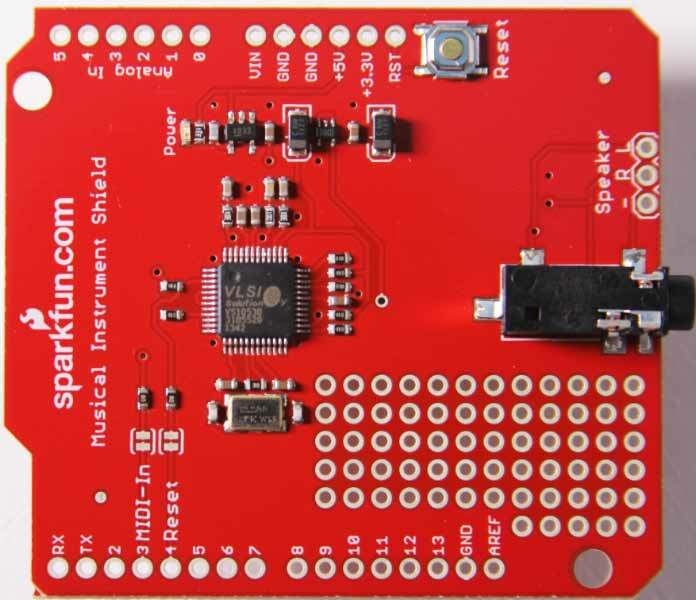 Sparkfun and SEEED Music Shield V2 . Octave shifting. Simple maths within the coding allows for either shifting octaves or changing keys. This makes for some very versatile creations. e.g. on the Planxtone it an now shift up and down through 5 octaves as well as play in keys C, G, D and F major. Perspex versus Chopping Boards I used Perspex initially, but then found polypropylene chopping boards from a variety of sources work well. Power Supplies, batteries and voltage regulators.. I've moved towards battery powered devices as this saves sorting out PAT testing. Pressure sensors I use off the shelf alarm pressure pads for most sound triggering. Special Effects Sound Boards Sparkfun WAV Triggers and Adafruit SFX. Switches (Push-button micro See actuators.